Used right, these gloves are quite fantastic. The different brands I’ve tried have all been pretty much the same: fairly heavy stretch fabric for warmth and a snug fit, and a rough-textured latex coating for waterproof protection and a good grip. Perfect for fall field work, when the temperature is around zero, and everything tends to be damp and cold. They’re close-fitting and not too thick, so the touch is sensitive enough for hand-harvesting of root crops in moist soil when you have to feel around, coiling muddy hoses, picking up various field debris. 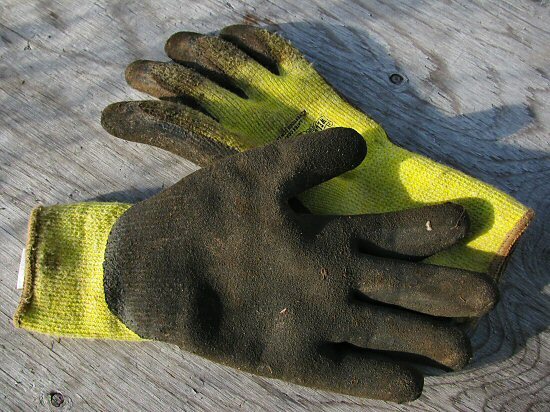 They’re also tough enough to use as work gloves, to move stuff like damp wood and metal. The trick is that they’re waterproof, and they also breathe, so your hands don’t sweat and freeze they way they would if they were completely waterproofed, but the tradeoff is, you can’t use them in water, only to grip wet things, the minute the fabric gets soaked, well, the fun is over. Most of the time, I choose bare hands: getting nicked, freezing, whatever, it’s usually worth it for that direct contact, and gloves are one less thing to keep track of. When I do decide to use gloves, having the right ones for the job is a little pleasure, and these guys have their place. Nice! I use several pairs of gloves ! Its a essential for me ! @Post Carbon, could you link to the Princess Auto gloves that you use? Here’s a link to the gloves I like best: Nitrile-Dipped-Gloves 3 pair for $5.00. So I buy 4 packages and have a dozen gloves for $20.00. Just went thru my gloves box and washed everything on Stain Wash. Paired them up, and please explain to me why I have 4 left-hand gloves and no right hand matches? It’s a mixture of the nitrile faves, and some cheapo loss-leader leather gloves from Home Hardware that Husband prefers (Mens-Red-Fleece-Lined-Home-Hardware-Work-Gloves) plus some old old cotton ones with the blue plastic stuff on them that is flaking off or sticking the fingers together. The fingertips are still good on them, so I can’t bear to throw them out.